Some of the images aren't working. Haven't picked up much the past few months, but I do have some items coming in. Here's my most recent additions. Waiting for series 2 to get Leo, I refuse to buy a Cena figure. agreed. such an awesome collab. I just want that Demon Finn Leo and my collection is complete. This beauty arrived today. Being stationed here in England I get the abality to order and ship both from the US and UK and not have to pay crazy shipping. Picked this up off Amazon UK for basically retail. This vol is getting hard to find. I regret not buying Vol. 1,2, & 3 two weekends ago at MCM Birmingham for 90 bucks. just came back from a day of a small comic con and some shopping. Dont think I did to bad. Really glad to have picked up the Blind Box exclusive covers. Got all 3 for 25 pounds. Such a good deal. Vol 1 finally arrived. Thank to Amazon for damaging the binding of the book however. This is also my first Mega Bloks and dang these are awesome. The one book I've wanted more than any other in my collection has arrived. 2nd print as thats the only print i'd buy other than a 1st print. So happy to finally own this issue. Newest piece from Ben Bishop has arrived. This is also my first Mega Bloks and dang these are awesome. 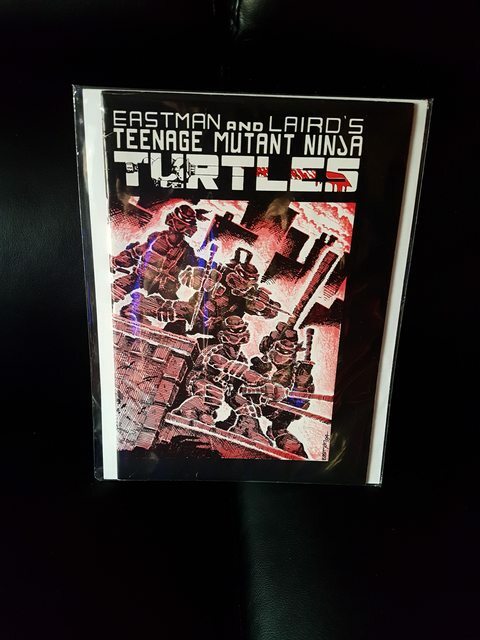 Is some of that the stuff you get when you join the Eastman fan club? Is it worth the $50? Bummer about the book damage. Are you sure it was Amazon? I have read several reviews and also seen one on YouTube about IDW and binding issues. IDW quality issues go into their tpb as well. I just picked some up and not a ten out of ten imo. However, I'm still considering getting that vol 1 and hoping for a good condition one. Wow. I love those pieces, especially the wraparound cover. Interesting to see Eric's take on Batman. Did you get them through his Etsy shop? No I've had Eric do some comissions for me in the past so I have his contact information. I just got in touch with him and told him I wanted two covers done. He surprised me with the wrap around. 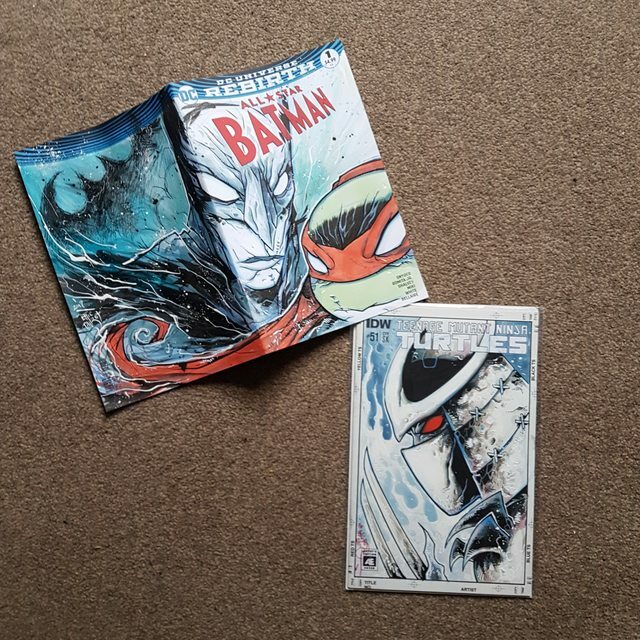 I talked to him yesterday after getting these and he even told me he really liked the batman/raph one. Said he was trying some things out and kinda went crazy with it. how long ago did you order this bro? So I'm currently deployed but I had to get my hands on this. Grabbed it at the lowest price I could and word is only 350 were made.